Edikang Ikong / Edikaikong soup is a nutritious Nigerian delicacy made with a generous amount of fresh leafy vegetables, dried fish and assorted meat. 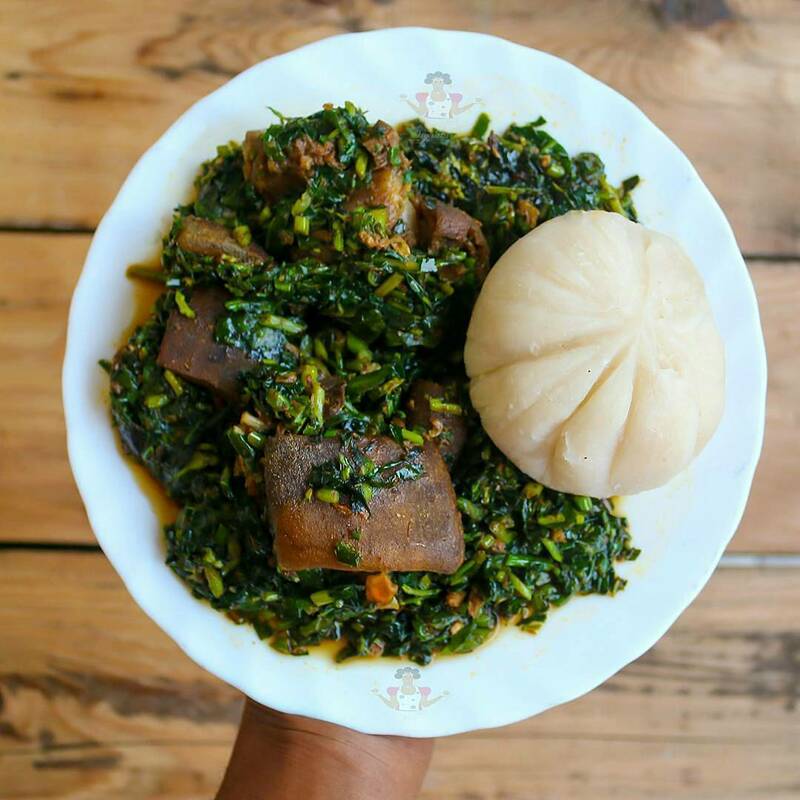 Edikang Ikong is highly nutritional and is usually cooked with a combination of two different vegetables; fluted pumpkin leaves (Ikong Ubong /Ugwu leaves) and also water leaves. Although in the absence of fluted pumpkin leaves and water leaves, Spinach and Lamb lettuce/Mache(Valerianella locusta) can be used. Get the vegetables(Fluted Pumpkin leaves/water leaves) ready by washing and cutting them into tiny bits(thin slices preferably) and set aside. Wash and cut the assorted meat in bite-able sizes. And then wash the periwinkles, dried fish and stock fish and set aside. Put the meat and the assorted fish stock in the pot. Add a little water, chopped onion, a little pepper and a cube of broth to season. Cook until all the meat is well cooked and in the pot there is only a little ‘liquid (remember to cook the hardest meat first)). When the meat is done, add the dried fish and the periwinkle. Also add the palm oil, ground pepper and shrimp and boil for about 10 minutes. Therefore add the water leaf ((or lamb lettuce)) and cook for 3 minutes. Then add the Fluted pumpkin leaves (Ikong Ubong / Ugu leaves) and salt to taste. And then Stir well and simmer for about 2-3 minutes over low heat and the Edikang Ikong soup is ready. Edikang Ikong can therefore be served with your choice of Usi(Starch),Pounded Yam, Eba, Fufu, Wheat meal (Tuwon Alkama), Semolina or Amala. How do I prepare Edikang ikong soup? How do you cook Ugwu and water leaf? How do you make delicious Edikaikong soup? How do you make EFO?